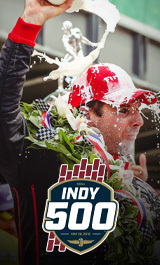 An exciting collaboration between the Indianapolis Motor Speedway and the Google Street View team allows fans around the globe to experience the sights and thrills of Indianapolis 500 Race Day in a brand-new way. The project, which can be viewed at ims.com/RaceView, provides a 360-degree view of the entire track layout just moments before the green flag is dropped to start the 2018 edition of the world’s largest single-day spectator sporting event. Fans can use the new interactive website to stroll down the front stretch and cross the iconic Yard of Bricks, head to Turn 3 for a look at the Snake Pit presented by Coors Light Stage or view the massive grandstands that line the world’s biggest sporting facility. The experience of capturing 360 imagery is now available for all to see in the Google Maps view and is chronicled in a Google Blog post. As part of the project, a Street View Camera was mounted to an IMS vehicle for a special lap just minutes before the beginning of the race. The effort was coordinated by Indianapolis native and Google employee Mike Abrams, who wanted to share Race Day with a wider digital audience. Along with being available for special viewing and supplemental video at ims.com/RaceView, the imagery captured at the event is also available right in Google Maps, an app used by billions of browsers each year.